Grandma has put her DRAW pictures on T-SHIRTS. DRAW WITH GRANDMA VOLUME 1 $6.00 GRANDMA CAN’T DRAW! But, together we can learn to draw, one step at a time. While we are drawing together we can learn about the alphabet, shapes and colors, and about what we are drawing. IT’S FUN TO DRAW TOGETHER! This DVD (volume 1) features 13 pictures using the letters A, B, C, and D. Both the upper case and the lower case letters are used along with the different letter sounds. Besides learning basic shapes and colors, these skills will be encouraged: Creatively Seeing and Experiencing Shapes; Sequencing and Following Directions; and Pre-writing/Beginning Drawing Skills. 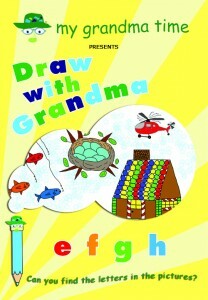 DRAW WITH GRANDMA VOLUME 2 $6.00 GRANDMA CAN’T DRAW! But, together we can learn to draw, one step at a time. While we are drawing together we can learn about the alphabet, shapes and colors, and about what we are drawing. IT’S FUN TO DRAW TOGETHER! This DVD (volume 2) features 18 pictures using the letters E, F, G, and H Both the upper case and the lower case letters are used along with the different letter sounds. Besides learning basic shapes and colors, these skills will be encouraged: Creatively Seeing and Experiencing Shapes; Sequencing and Following Directions; and Pre-writing/Beginning Drawing Skills. 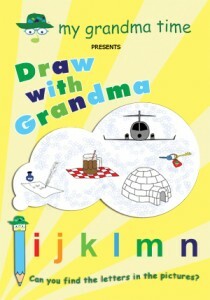 DRAW WITH GRANDMA VOLUME 3 $6.00 GRANDMA CAN’T DRAW! But, together we can learn to draw, one step at a time. While we are drawing together we can learn about the alphabet, shapes and colors, and about what we are drawing. IT’S FUN TO DRAW TOGETHER! This DVD (volume 3) features 24 pictures using the letters I, J, K, L, M, and N. Both the upper case and the lower case letters are used along with the different letter sounds. Besides learning basic shapes and colors, these skills will be encouraged: Creatively Seeing and Experiencing Shapes; Sequencing and Following Directions; and Pre-writing/Beginning Drawing Skills. DRAW WITH GRANDMA VOLUME 4 $6.00 GRANDMA CAN’T DRAW! But, together we can learn to draw, one step at a time. While we are drawing together we can learn about the alphabet, shapes and colors, and about what we are drawing. IT’S FUN TO DRAW TOGETHER! This DVD (volume 4) features 23 pictures using the letters O, P, Q, R, S, and T. Both the upper case and the lower case letters are used along with the different letter sounds. Besides learning basic shapes and colors, these skills will be encouraged: Creatively Seeing and Experiencing Shapes; Sequencing and Following Directions; and Pre-writing/Beginning Drawing Skills. Here are some samples!….Use them at home or in the classroom! Draw something that begins with the letter A. Draw something that begins with the letter B. Draw something that begins with the letter C.
Draw something that begins with the letter D.
Draw something that begins with the letter E.
Draw something that begins with the letter F.
Draw something that begins with the letter G.
Draw something that begins with the letter H.
Draw something that begins with the letter I. Draw something that begins with the letter J. Draw something that begins with the letter K.
Draw something that begins with the letter L.
Draw something that begins with the letter M.
Draw something that begins with the letter N.
Draw something that begins with the letter O. Draw something that begins with the letter P.
Draw something that begins with the letter Q. Draw something that begins with the letter R.
Draw something that begins with the letter S.
Draw something that begins with the letter T.
Click here to see the pictures that Grandma’s friends have drawn.